Canyon Ferry Stoplog Guide Removal - Global Diving & Salvage, Inc. 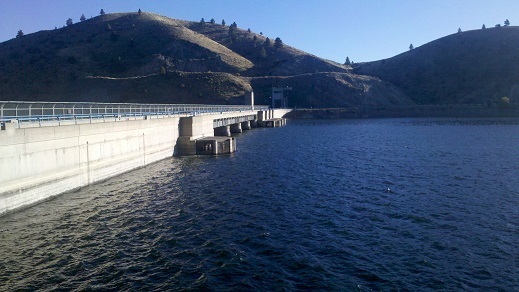 When new stoplogs were installed on the pier noses of Canyon Ferry Dam in Helena, MT the new seats were bolted in place with anchors that were cored and grouted into the dam, making the old stoplog seats unnecessary. Global was contracted to remove the existing stoplog guides and seats, while preserving the stainless steel fabrications for future reuse. The bolts were carefully removed to minimize damage to the seats, and core drilling was used to remove the entire embedded portion of the anchor. Any deteriorating grout was eliminated from the anchor holes and the holes were pumped with new grout. The old stoplog guides and seats were carefully cleaned, thoroughly inspected for damage and transported to shore for storage at the owner’s facility.